We have lots of Babyology readers letting us know that there should be more for boys. We agree and now there actually is with More 4 Boys. Designer Debbie Jukes wanted her own boys to look cool even if they were dirty and to be wearing comfortable but stylish clothes whether they be kicking the footy in the park or dominating video games. More 4 Boys moves away from the standard images we see so often on boys clothing. There is still a good dose of street cred with tees and hoodies featuring extreme BMX bikers, space invaders and witty slogans but for summer, the latest collection of ‘beach‘ designs are a winner – surfboards, thongs, a scuba diving mask and a car loaded with boards all have a distinct retro feel and come in a great range of cool colours including two shades of blue, sage green and musk. Special mention must be made of the More 4 Boys ‘Endangered Species’ shirts. A portion of the profits from the Endangered Species collection goes to supporting the Melbourne Zoo. For summer 2010, the elephant is centre stage and stay tuned for next winter’s gorilla design. 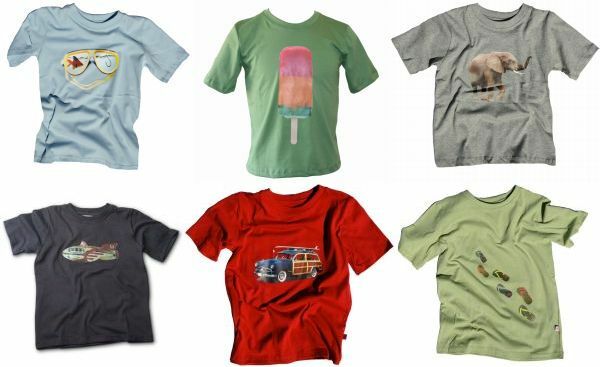 New season’s collections from More 4 Boys were on show at the recent Kids Instyle trade show and we got to see all these great t-shirts first hand – the challenge is choosing! More 4 Boys are available in sizes zero to twelve and prices start at $39.95. Shop online at More 4 Boys or find them at one of many stockists around Australia.